Chili and cornbread is one of our favorite meals this time of year. I decided to combine the two into one delicious casserole. Sweet cornbread topped with a quick homemade chili. Comfort food at its best!! SO good!! 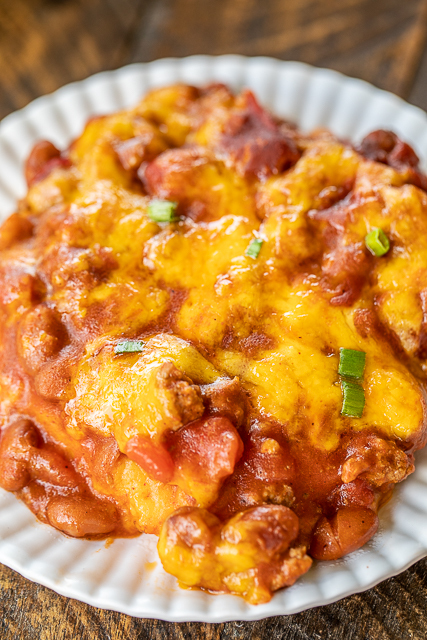 This Chili & Cornbread Casserole is super easy to make. 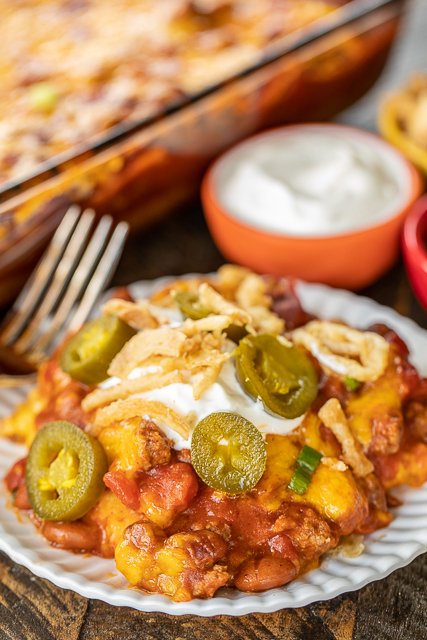 The hardest part of this recipe is waiting 5 or 10 minutes for the casserole to cool off before digging in. You need to give the cornbread a few minutes to set up before slicing into the casserole. It will fall apart if you dive right in after pulling it out of the oven. 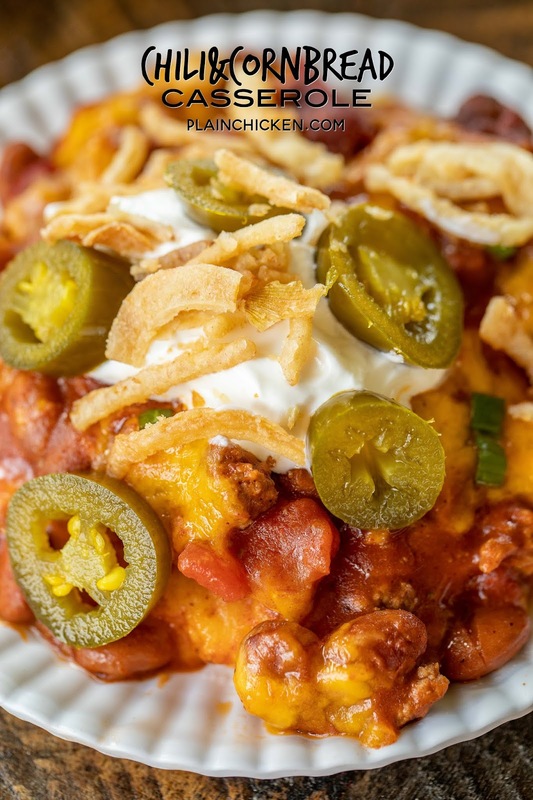 We absolutely loved this Chili & Cornbread Casserole. The combination of sweet cornbread and savory chili was perfect! I added beans to my chili. If you don't like beans, just omit them from the recipe. It will still taste great! If you like a spicer chili, swap out the diced tomatoes for a can of diced tomatoes with green chiles. YUM! We topped the casserole with our favorite chili toppings - sour cream, jalapeño and fried onions. YUM! 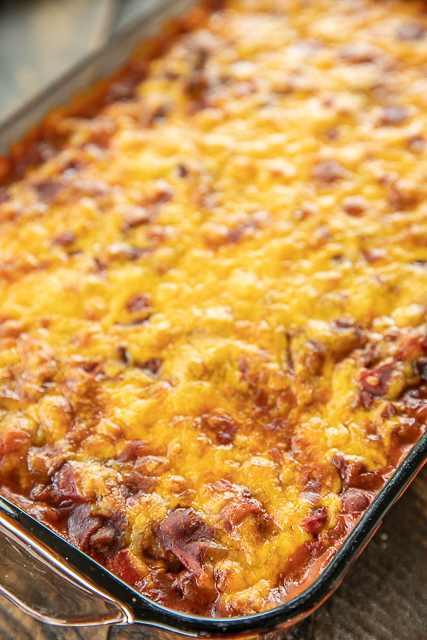 Give this Chili & Cornbread Casserole the next time you get a craving for chili. I promise it won't disappoint!! Preheat oven to 400ºF . Coat a 13 x 9 x 2-inch baking dish with nonstick cooking spray. Set aside. In a large skillet over medium heat, cook ground beef until no longer pink. Drain fat. Add chili seasoning packet, diced tomatoes, chili beans and tomato sauce. Cook for an additional 5 minutes. Pour beef mixture over cornbread and top with remaining cup of cheese. Bake for and 20 additional minutes. What kind of muffin mix do you use? I'm not a big fan of the sweet mix and wondering which less sweet version works. Can this be cooked with the cornbread on top to give it a crust? I'm sure it can. This recipe is very similar to a Mexican cornbread which has the meat on the bottom and cornbread on top. Just cook the cornbread as directed by the instructions. I haven't made this with the creamed corn. So without further recipe testing, I cannot answer with certainty. As always, please use your best judgment regarding substitutions and modifications. You can just skip the cornbread with creamed corn and make buscuits or get some rolls as a substitute. 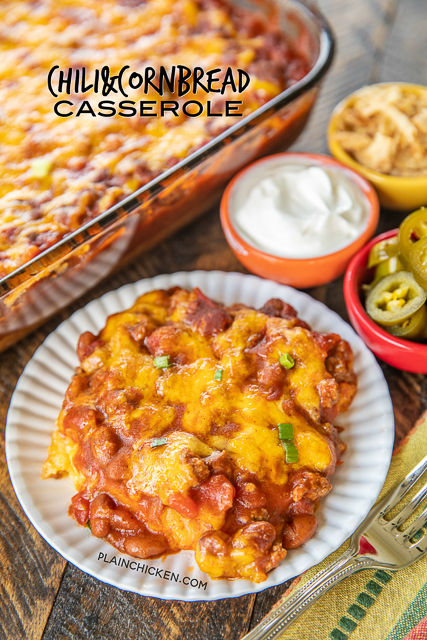 The yummy chili casserole will go with anything!! No, you do not have to use the corn. If you omit the corn just add a splash more milk to make up for the liquid in the creamed corn. Another thing I like to do sometimes is add some chopped jalapenos or green onions to the cornbread mixture. Good luck and enjoy. Yum! Love a good comfort food -- great idea to add a few French Fried onions too! OH.MY.GOODNESS!! I made this for supper tonight and it was SOO good!! My husband and my son told me not to make chili again unless I made it like this!! It was super easy too! So very good! Thank u!